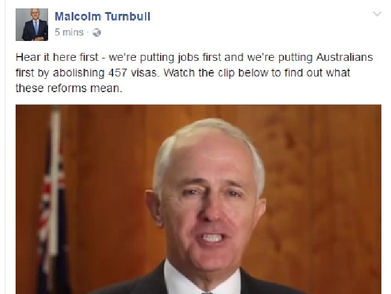 Date 18.04.2017 Turnbull government will abolish the 457 visa from March 2018. Why is the 457 Visa being abolished? There has been a concern that there are thousands of overseas workers moving to Australia when there are Australians also available for work in the trades and nursing industry. A new temporary work Visa program will be introduced to focus on occupations that do need the work from overseas workers. The Government will replace the 457 Visa Program with 2 new visa programs – one for two years and another for four years. The new scheme will have more safeguards to prevent the inappropriate use of the visas, including better English language proficiency requirements and labour market testing.